Action: It stops gums bleeding, prevents inflammations, propagating of the pathogenic bacteria, promotes fast healing of wounds in an oral cavity, provides fresh breath. 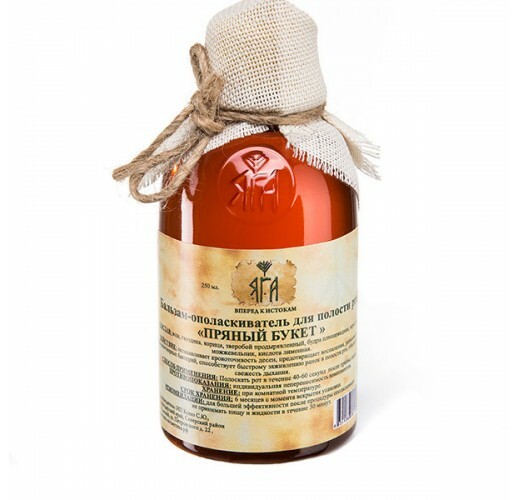 Ingredients: Water, Clove, Cinnamon, St John's wort, Ground Ivy, Oak bark, Juniperus, Citric acid. Suggested use: To rinse a mouth within 40-60 seconds after meal. Recommendations: For bigger efficiency it is better not to eat food and liquids within 30 minutes after using. Volume: 250 ml. Expiry: 6 months from the moment of opening.